i was tired but i didn't need too much sleep. i woke up around 6am, checked the time, and went back to bed after using the bathroom, realizing i had many more hours of sleeping still available. i finally did get out of bed at 10am, got dressed, put away all my stuff, then quietly left the room leaving dan and cymara still sleeping in their bed. i went out to check to see if the car was still there. my spider sense's told me last night that maybe the car would be gone the next morning. i was relieve to see it was still there, in one piece. i stored the suit in the trunk along with my bag and shoes. returning to the room, i realized i was actually locked out. the weather was nice so i decided to sit outside, taking some notes in a piece of paper i found in my coat pocket, drinking a bottle of leftover ice tea from the car. 30 minutes later, i went back to the room and knocked. cymara, sleepily, opened the door to let me back in. they were just about to wake up. i went back outside to do some more exploring. in the stairwells they had vending machines. one was for drinks, set in a very retro box. another was for vending various snacks and items of necessity, such as condoms, tampons, and playing cards. 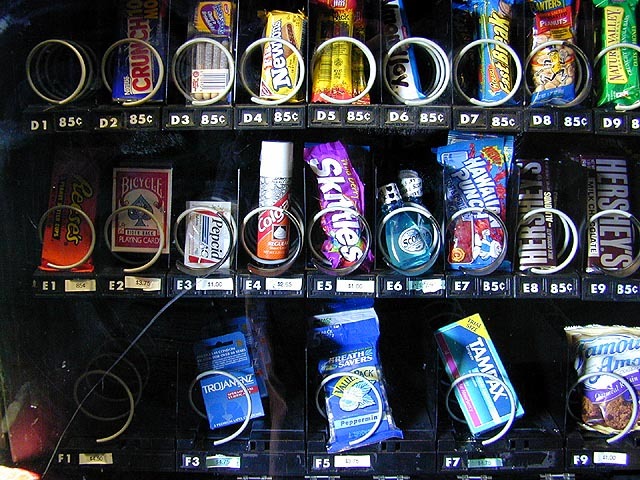 if i had a vending machine, it'd vend dental floss, various kinds of meat jerkies, and disposable cameras. the motel also advertised free continental breakfast, which i was eager to try. turns out breakfast was in this garish waiting room, one wall decorated with a mirror, while the others had red patterned wallpapers. an old man with a cane sat at the end of the room, suspiciously eyeing me as i came in. an old woman stood by a counter, said, "what can i get you, dear?" when i came in without returning around (she saw me from the mirror). "do you want some coffee?" she said with a graveling long island accent. "sure, yeah, i'll take some coffee," i answered her quietly. along with some coffee i also got a small rectangular corn bread muffin, which was about the extent of the selection. i sat down eating my breakfast, flipping through some newspaper magazines on a coffee table, all the while the old man was talking with the old woman yet at the same time still fixing his eyes on me. i tipped the woman $1 and then left the waiting room. back in the room (i took the key this time so i wouldn't get locked out), dan was in bed watching television while cymara was taking a shower. the big news on television was the "rescue" of the 7 american POW's. it was pretty good news because i thought they were probably killed since the marines couldn't find them in baghdad. we packed up our stuff and left, dan returning the key to the motel attendant downstairs. since they didn't have the continental breakfast like i did (it was over by 11am), dan and cymara wanted to find someplace to eat. we ended up at the seven seas restaurant, which was amazingly crowded with either senior citizens or families having brunch together. our waiter was devoid of humor, but we tipped him well nevertheless. i had the belgian waffles with bacon which i didn't think was that good because there wasn't any strawberry preserve or whip creme. we made it back to boston in record time, thanks to the fast lane and the very nice weather. cymara sat in the front seat and i asked her every single question i could ever want to know about brazil, which she seemed to be more than happy to answer for me. i was so happy to be home. while making a three-point turn into a parking spot, i accidently bumped alex's car into a fence post, sustaining a few scratches. it's true what they say, most car accidents happen within a few miles of home. i drove the car all the way to long island in the pouring rain with no problem, and when i finally get back, i end up dinging the car. irony! my parents came by for dinner after they got out of work. i watched an alias repeat, then later in the evening paula and jonathan showed up with some dvd work they've been doing for me, coming over to deliver them but to also test it on my dvd player. the discs were perfect. paula and jonathan went back home, returning south of the charles river.